Featured, from left: Rep. Terry Canales, D-Edinburg, Congressman Rubén Hinojosa, D-Mercedes, and Rep. Óscar Longoria, Jr., D-La Joya, on Tuesday, March 25, 2014, after addressing the South Texas College Board of Trustees at the Pecan Campus in McAllen. Legislation proposing the creation of a South Texas College extension facility in the Delta Region of Hidalgo County, which was approved by the House of Representatives on Friday, May 8, is set for a Senate committee hearing on Monday, May 18, Rep. Terry Canales, D-Edinburg, has announced. Originally filed to create a branch campus of STC in the Delta Region, Canales changed the language of House Bill 382 to instead call for the creation of an extension facility in order to dramatically reduce the financial cost to the state, which significantly improves its chances of legislative passage. “By requiring an extension facility, STC would be directed by the Texas Legislature to set up a physical presence in the Delta Region, a move that can eventually lead to a branch campus,” Canales said. “What we are wanting to do is move this one step further down the line. We believe that whatever concerns the college may have about the fiscal viability of this program will be shown dramatically to be unfounded because it will quickly flourish.” According to the Texas Higher Education Agency, a branch campus is a major, secondary location of an institution offering multiple programs, usually with its own administrative structure and usually headed by a Dean. A branch campus must be established by the Legislature or approved by the Coordinating Board. He said that STC has an obligation to spread its resources to areas of Hidalgo County which have the population base and geographic location to deserve an extension facility, and eventually, a branch campus. “The Delta Region has historically been a neglected area that can see a positive change from this bill. The area needs better access to higher education to have the same opportunities (as other communities with STC campuses and sites),” Canales said. But times are changing, and for the better, in the Delta Region, further justifying predictions that STC would also grow with those communities. “If we talk about demographics and you look at companies and ask, ‘What are the demographics there?’ Well, they just opened up a Walmart Supercenter, and a new H.E.B., and those businesses conduct incredible demographic studies before they make those multi-million dollar capital investments,” he continued. Canales also spoke about ongoing plans by the state transportation leaders to connect FM 1925, known as the Monte Cristo Road project, between Edinburg and South Padre Island, a thoroughfare which will go through the Delta Region. “The Texas Department of Transportation has opted to expand what is the existing Monte Cristo Road into a highway that will go all the way to Cameron County,” Canales said. “That is why Rep. Lucio and his father, Sen. Eddie Lucio, Jr., and Rep. René Oliveira, support this bill.” The public hearing will take place before the Senate Committee on Intergovernmental Relations, whose chairman is Sen. Eddie Lucio, Jr., D-Brownsville. The meeting, which is open to the public, was at 8:30 a.m. in Room E1.028 of the Texas Capitol complex. The session is available for live viewing on the Internet, or afterwards as a video recording in its entirety, by logging on to http://www.senate.state.tx.us/bin/live.phpby , find the desire program at the bottom of that web page, and click the “play” button. The live programs are listed by their scheduled start time. 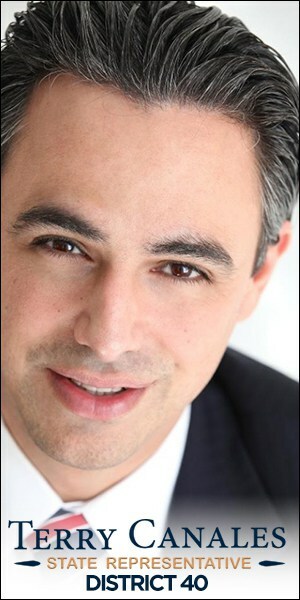 Lucio is the Senate sponsor of the measure, House Bill 382, of which Canales is the primary author. Canales’ proposal also enjoys vital support from House legislators from the two South Texas counties – Hidalgo County and Starr County – which STC serves. 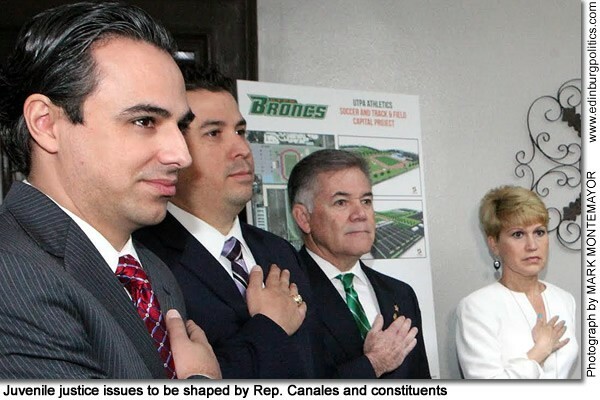 Rep. Óscar Longoria, Jr., D-La Joya, Rep. Armando “Mando” Martínez, D-Weslaco, Rep. Ryan Guillén, D-Rio Grande City, and Rep. Eddie Lucio, III, D-San Benito, are joint authors of Canales’ HB 382. The measure, which was approved by the House of Representatives on Friday, May 8, would require STC, which has campuses in McAllen, Weslaco and Rio Grande City, to establish an extension facility in either Elsa, which is in Canales’ House District 40, or in Edcouch, which is in Longoria’s House District 35. Under the proposal, the STC Board of Trustees are directed to set up the extension facility beginning with the 2016-2017 academic year. The legislation does not authorize STC to increase its property tax rate. Featured on Wednesday, February 26, 2o14 accepting a Hidalgo County Commissioners’ Court proclamation in support of the creation of a South Texas College branch campus for the Delta Region are, front row, from left: Cynthia (Cindy) Garza-Reyes, Interim District Director of the Edinburg Office for Congressman Rubén Hinojosa, D-Mercedes; Rep. Óscar Longoria, Jr., D-La Joya; and Alex Ríos, District Director for Rep. Terry Canales, D-Edinburg. Back row, from left: Hidalgo County Commissioner Joseph Palacios; Hidalgo County Judge Ramón García; and Hidalgo County Commissioner A.C. Cuellar, Jr. Featured, from left: Wanda F. Garza, Vice President of Student Affairs and Enrollment Services, South Texas College; Rose Benavídez, Member, Board of Trustees, District 1, South Texas College; Dr. Shirley A. Reed, President, South Texas College; and Rep. Sergio Muñoz, Jr., D-Mission, at the House District 36 lawmaker’s Capitol office on Tuesday, February 3. 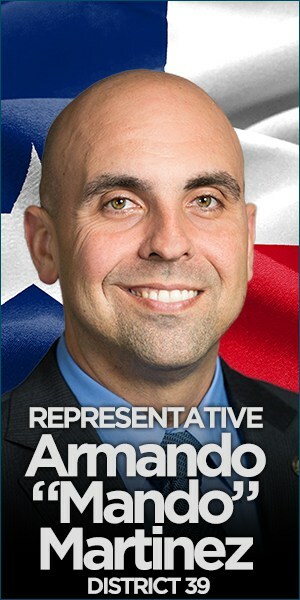 With the goal of increasing educational opportunities while improving public safety and border security, Rep. Sergio Muñoz, Jr., D-Mission, is carrying several measures designed to help fight crime, including landmark legislation that could eventually lead to the establishment of a full-fledged South Texas College campus in Pharr. House Bill 1887, filed by Muñoz on Tuesday, February 25, would allow South Texas College to create the Regional Center for Public Safety, which would be built on a yet-undisclosed 50- to 60-acre site to be donated by the City of Pharr. 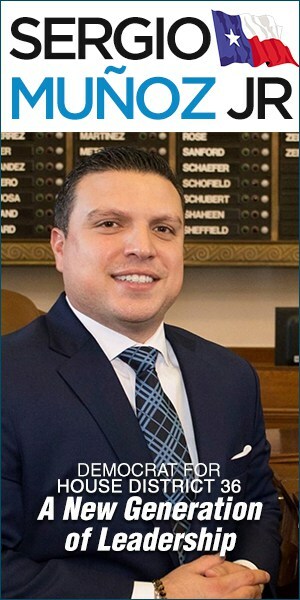 With Muñoz serving as the primary author – which means the legislation is the idea of the Mission Democrat – Rep. Terry Canales, D-Edinburg, on Monday, March 9, signed on as a joint author in support of HB 1887. “Having such an educational facility for our current and future law enforcement officials will be a tremendous benefit for the delivery of justice and the protection of all of us in deep South Texas,” said Canales, whose House District 40 includes 19 percent of the City of Pharr. “I appreciate Rep. Muñoz allowing me to sign on as joint author of HB 1887, and I look forward to working with him and the leadership of Pharr and South Texas College on this most important legislative effort.” Muñoz’ House District 36 includes 76 percent of the City of Pharr. Included in HB 1887 is language that would authorize South Texas College to also allow “aspiring law enforcement officers to earn a bachelor’s degree that will provide more career opportunities for our community,” Muñoz said. 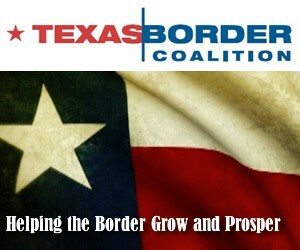 “STC is positioned to offer a bachelor’s degree in Homeland Security, Public Safety and Law Enforcement, or whatever degree specifically responds to the needs of our metropolitan region.” STC officials would be responsible for developing the appropriate bachelor’s degree program, which would have to receive final approval from the Texas Higher Education Coordinating Board, the lawmaker added. Currently, 1,751 law enforcement officers are employed in Hidalgo and Starr counties, with the intent to hire 134 additional certified officers during the current fiscal year. The Texas Workforce Commission predicts that there will be a 22 percent increase during the next 10 years for more certified police officers in these two counties, but access to training opportunities is limited. “HB 1887 would serve the greater need of the Valley’s law enforcement personnel, as facilities become available, by increasing the number of instructional programs offered in deep South Texas with new certificate and associate of applied science degree in programs such as police administration, forensics, emergency management, leadership, aircraft rescue, homeland security, special weapons and tactics,” said Muñoz. HB 1887 states that STC would administer the regional center in partnership with political subdivisions and participating school districts in the Valley, and would require the headquarters of the regional center to be located “at South Texas College in Pharr.” His bill would allow the regional center to use property and facilities at other locations in Hidalgo and Starr counties. Muñoz is working with Sen. Juan “Chuy” Hinojosa, D-McAllen, and Sen. Eddie Lucio, Jr., D-Brownsville, to secure support in the Senate. 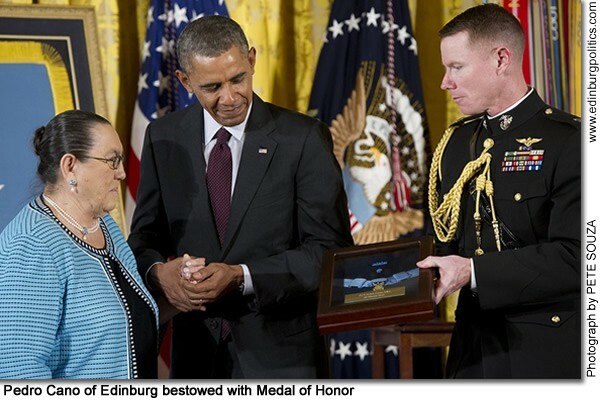 On Tuesday, March 18, President Barack Obama awarded 24 Army veterans – including a posthumous national recognition for Pedro Cano of Edinburg – the Medal of Honor for conspicuous gallantry. One of Cano’s daughters, Dominga Cano Pérez of Reedley, California, accepted the Medal of Honor on his behalf from President Obama during the ceremony held in the East Room of the White House. 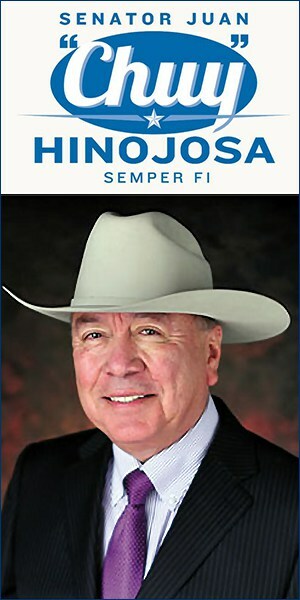 “This is the single largest group of service members to be awarded the Medal of Honor since the Second World War,” Obama said, adding that “their courage almost defies imagination.” Congressman Rubén Hinojosa, D-Mercedes, whose congressional district features Edinburg, reflected on the importance of the national honor, not only to Cano and his family, but for the country. “Many wrongs have finally been made right in the case of Pedro Cano and twenty three other American heroes who have received the highest honor that a military serviceman or woman can earn, the Medal of Honor,” Hinojosa said. “For decades these men were not recognized for their outstanding feats of courage. They were never honored for the American lives they saved. Sadly, they were never honored for their extraordinary patriotism because of their ethnicity, the color of their skin and their religion.” Cano is the second Edinburg man to receive the nation’s highest military honor. On October 31, 1969, Alfredo “Freddy” Cantú González, a U.S. Marine, was posthumously bestowed the Medal of Honor for his actions, which led to his death in combat, during the Battle of Hu? in 1968, one of the bloodiest and longest battles of the Vietnam War. Cano died in an automobile accident in Edinburg in 1952. Both men are buried at Hillcrest Memorial Park Cemetery in Edinburg. See lead story in this posting. Major issues affecting juvenile justice in Texas, including protecting the rights of juries to have more options in the punishment and rehabilitation of 17-year-olds accused of serious felonies, was taken up in Austin on Tuesday, March 25, by the House Criminal Jurisprudence Committee. Rep. Terry Canales, D-Edinburg, featured left, is the only Valley lawmaker on the nine-member legislative panel, which is chaired by Rep. Abel Herrero, D-Corpus Christi. The committee heard from expert witnesses, as well as allowed verbal and written testimony Texans, during the public hearing the State Capitol. The session focused on studying the classification of 17-year-olds as adults in the criminal justice system of Texas. “Serious concerns nationwide and in Texas have been raised regarding whether placing 17-year-olds, who are still not adults, under the control of the adult criminal justice system, where they are more likely to become hardened criminals, and where they are more vulnerable to physical and sexual assaults than in juvenile justice facilities,” said Canales. Featured during grand opening ceremonies earlier this year at his legislative office in Edinburg are, from left: Rep. Terry Canales, D-Edinburg; Agustín “Gus” García, Jr., Executive Director, Edinburg Economic Development Corporation; Edinburg Mayor Pro Tem Elías Longoria, Jr.; and Irma Garza, Director of Public Information, City of Edinburg. 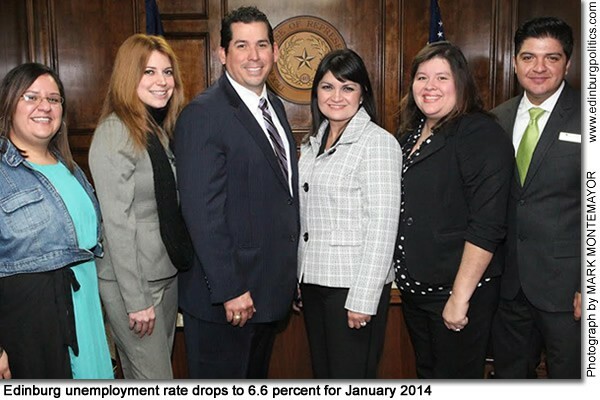 Edinburg’s unemployment rate for January 2014 was 6.6 percent, an improvement over the December 2013 figure of 6.8 percent and the best showing for the month of January since 2009, when the unemployment rate for that month was 6.2 percent, the Edinburg Economic Development Corporation has announced. For the month of January 2014, only McAllen has a better figure at 6.3 percent, while the other major communities in the Valley ranged from 7.3 percent (Harlingen) to 10.5 percent (Brownsville) for that month. In addition, Edinburg’s labor force was the third largest in the Valley, with 33,363 persons employed in the city for January 2014. The area’s two most populous cities, Brownsville and McAllen posted larger numbers at 62,488 and 58,310 individuals, respectively, employed in January 2014. The latest figures were released on Friday, March 7, by the Texas Workforce Commission. Mayor Richard García, who also serves as president of the EEDC Board of Directors, said the number of jobs in Edinburg is expected to grow, not only because the city’s population continues increasing, but as a result of Edinburg being a major center of education, government, health care, and retail. “Soon, hundreds of jobs will be added when Walmart opens its third store, located near the intersection of U.S. Expressway 281 (recently renamed I69-Central) and Canton Road just south of The Shoppes at Rio Grande, and that will help lower our unemployment rate,” the mayor noted. “Right across the street from The Shoppes at Rio Grande, HEB has announced its own plans to build a major new store, which will provide even more jobs for our community and region.” The EEDC is the jobs-creation arm of the Edinburg City Council. EEDC staff, featured from left, are: Laura Lee Vela, Administrative Assistant; Leticia Reyes, Director of Business Development and Public Affairs; Agustín “Gus” García, Jr., Executive Director; Nelda T. Ramírez, Assistant Executive Director; Dalila Razo, Business Manager; and Freddie Gómez, Research Analyst. The University of Texas-Pan American College of Education honored more than 40 educators at its ninth annual Teacher of the Year Awards on Wednesday, November 20 at the UTPA Community Engagement and Student Success Building. 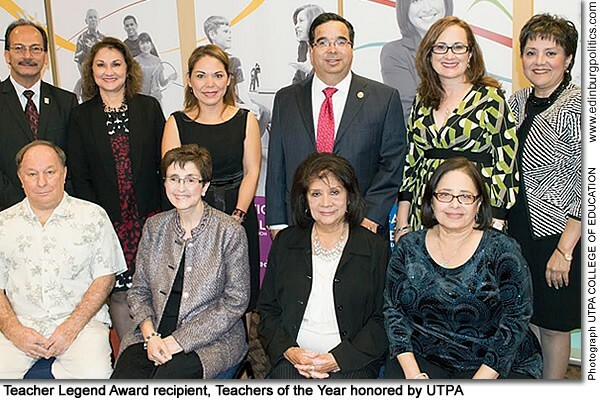 UTPA and College of Education administrators praised the elementary and secondary school teachers of the year for their dedication to educating students and presented plaques and other gifts to them. The College of Education also awarded its Teacher Legend Award to Gloria Judy Saca-Díaz, who taught for 19 years at two elementary schools in the Edcouch-Elsa Independent School District. Seated, from left: former Teacher Legend Award recipient Wayne Miller; current Teacher Legend Award recipient Gloria Judy Saca-Díaz; and former Teacher Legend Award recipients Sylvia Alvarado and Criselda J. Guerra. Standing, from left: Dr. Havidán Rodríguez, Provost and Vice President for Academic Affairs, The University of Texas-Pan American; Dr. Velma Menchaca, Department Chair and Professor of Educational Leadership, The University of Texas-Pan American; Dr. Joy Esquierdo, Associate Professor of Curriculum and Instruction, The University of Texas-Pan American, who nominated Gloria Judy Saca-Díaz; Dr. Salvador Héctor Ochoa, Dean, College of Education, The University of Texas-Pan American; Dr. Verónica Estrada, Professor of Curriculum and Instruction, The University of Texas-Pan American; and Rachel Arcaute, Assistant Superintendent of Instruction Services, McAllen Independent School District. Area residents who enjoy poker are invited to purchase tickets for the Edinburg Chamber of Commerce’s first annual “Chamber Royale” Texas Hold’Em and Fold’Em Poker Tournament, scheduled for Friday, April 25, at the historical Southern Pacific Depot. The entry fee per person is $100 with a $25 re-buy option. 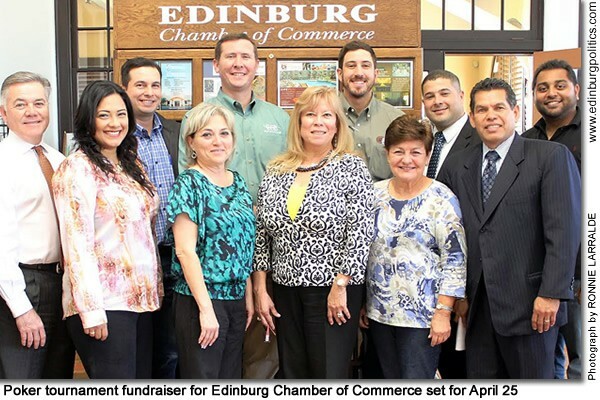 The proceeds will go to help the Edinburg Chamber of Commerce, which is located in the Southern Pacific Depot, 602 West University Drive, provide many of its vital services to its membership and the community. The top 10 players will receive prizes, ranging from a trip to Las Vegas to a flat-screen television to a weekend at South Padre Island. No cash prizes are allowed by state law. 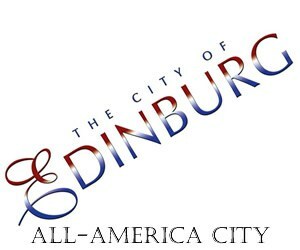 Participants do not have to be members of the Edinburg Chamber of Commerce. Each ticket includes a seat at the table, open bar, appetizers, and the opportunity to win the table prizes. For individuals who only want to watch the high-skills competition, a spectator pass is available for $25, which also includes a meal and beverage. For tickets or more information, please contact the Edinburg Chamber of Commerce at 956/383-4974 or log on to http://www.edinburg.com. The tournament fundraiser will begin at 6 p.m. and last past midnight. Registration may take place the night of the event, but participants may pre-register at any day before the fundraiser. Featured are Edinburg Chamber of Commerce Board of Directors members and other leaders, including, first row, from left: Edinburg Mayor Pro Tem Elías Longoria, Jr. (Texas Regional Bank); Dina Araguz (IBC Bank); Letty González, President, Edinburg Chamber of Commerce; Elva Jackson Garza(Edwards Abstract and Title Co.); Maggie Kent; and Edinburg Municipal Court Judge Terry Palacios (García, Quintanilla and Palacios). Back row, from left: J.J. Flores (Chorizo De San Manuel); Robert McGurk, Chairman of the Board, Edinburg Chamber of Commerce (Elsa State Bank & Trust Co. of Edinburg); Greg Martin (Martin Farm & Ranch Supply); Jacob De León (Memorial Funeral Home); and Hiren Govind (Best Western-Edinburg Inn & Suites). 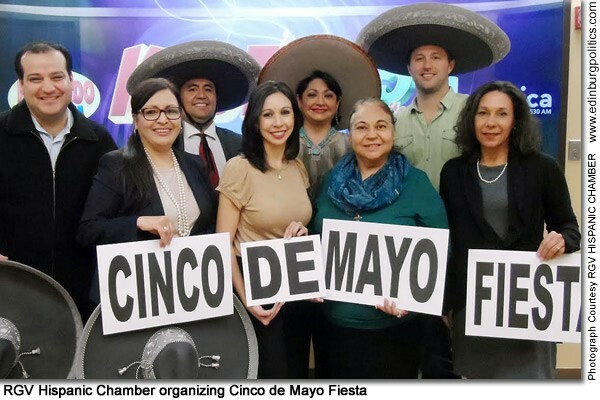 The “Cinco de Mayo Fiesta”, sponsored by the Rio Grande Valley Hispanic Chamber of Commerce and Univision Radio, will take place on Sunday, May 4, at the the Rio Grande Valley Livestock Show Grounds in Mercedes. The event will be bustling with major music entertainment, games, wrestling, food and crafts vendors, a dog costume contest, Bingo, Chihuahua races, jalapeño-eating, a Kiddie Playground, and other entertainment. Gates will be open from noon till 10 p.m. Sponsorships and food and crafts/informative vendors are being sought. More information on the event, including sponsorships, is available by contacting the RGV Hispanic Chamber of Commerce at 928-0060 or Univision Radio at 631-5499. Featured helping finalize the fiesta details are, front row, from left: César Chapa, Event Director, Univision; Vicky Guerrero, General Manager, Univision; Edna García, RGVHCC; Brenda Lee Huerta, Public Affairs Director, RGVHCC/Univision; and Sarah Sánchez, Editorial Page Editor, The Monitor, and RGVHCC. Back row, from left: Mario Lizcano, RGVHCC; Cynthia M. Sakulenzki, RGVHCC president and CEO; and Travis French, RGVHCC. 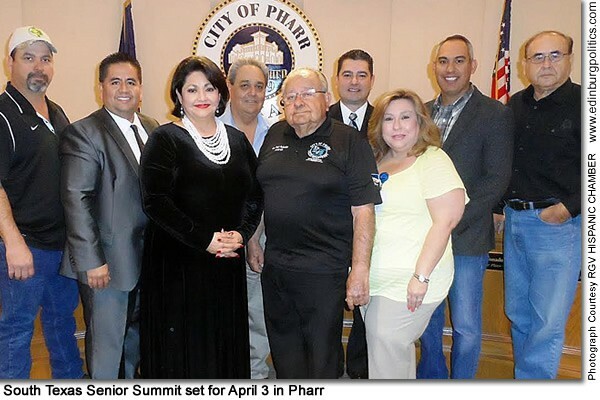 Realizing the importance of taking care of our senior community, The City of Pharr will co-sponsor the annual South Texas Senior Summit on Thursday, April 3, at the Pharr Event Center located at 3000 U.S. Expressway 281 in Pharr. The Summit will feature free screenings and information booths that are important to the older South Texans. Glucose, blood pressure, bone density, foot and vein are among the medical screenings that will be available. Various organizations will provide information on Social Security, Medicare, Medicaid, adult aging, a county services. A “pamper corner” offering free massages and nail polish changes will also be offered to the seniors. 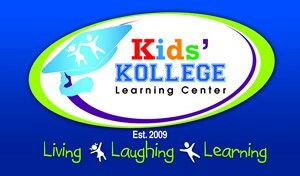 In addition, attendees will also get to participate in a light Zumba, Bingo, door prizes and a dance. Lunch and snacks will also be served. “We encourage senior centers, nursing homes, individuals and senior organizations to attend and make a day of this fun, healthy and informative event,” said Cynthia M. Sakulenzki, President and CEO of the Rio Grande Valley Hispanic Chamber of Commerce. Among the major sponsors for the Senior Summit are Lee’s Pharmacy, Superior HealthPlan and Cigna HealthSpring. Vendors will also be available with services and products to offer the senior community. More information on the Senior Summit, including registration, is available by calling the RGV Hispanic Chamber at 928-0060. Featured meeting to review plans for the event are, front row, from left: Cynthia M. Sakulenzki, President and CEO of the Rio Grande Valley Hispanic Chamber of Commerce; Pharr Mayor Polo Palacios; and Maribel Cárdenas, Senior Summit committee member representing sponsor Cigna Health Spring. Back row, from left: Pharr Commissioner Bobby Calvillo; Mario Lizcano, Vice Chair of Health, Rio Grande Valley Hispanic Chamber of Commerce; Pharr Commissioner Arturo Cortéz; Pharr Commissioner Erinuondo Maldonado; Phsrr Commissioner Jimmy Garza; and Pharr Mayor Pro Tem Adan Farías. Chancellor Francisco G. Cigarroa, M.D. (featured center), a nationally renowned leader in higher education and pediatric transplant surgery, announced on Monday, February 10, that he will step down as head of The University of Texas System after a five-year tenure marked by groundbreaking accomplishments. 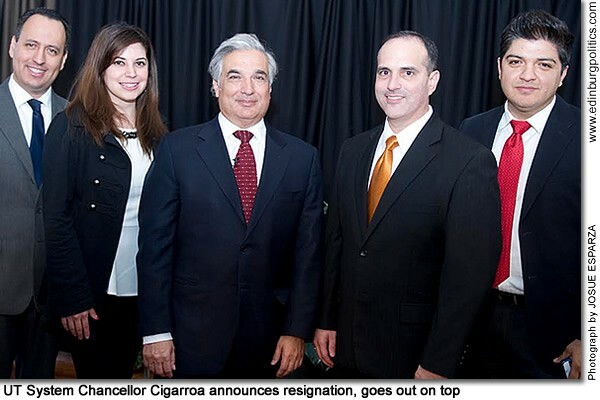 Cigarroa will serve as chancellor until his successor is named, and afterward will become the head of pediatric transplant surgery at the UT Health Science Center at San Antonio. 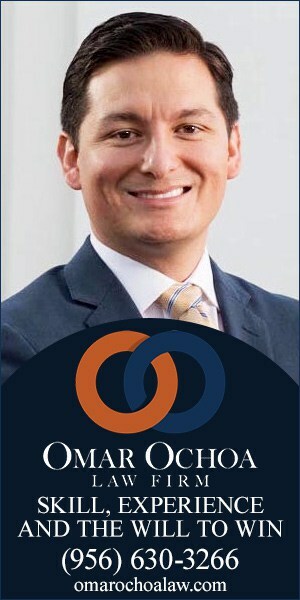 Cigarroa will also serve as a special liaison to the Board of Regents to advise on the development of the new University of Texas-Rio Grande Valley and medical school. 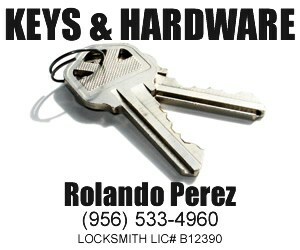 Cigarroa was also instrumental in the effort to establish a new university and medical school in the Rio Grande Valley. The Texas Legislature approved the initiative in 2013, and the University of Texas-Rio Grande Valley is scheduled to enroll its first class in the fall of 2015. His leadership was also pivotal in creating the Dell School of Medicine at UT Austin – fulfilling a long-held dream of integrating a medical school with UT’s flagship academic university in Austin. Featured during a February visit to UT-Pan American are, from left: Ramiro Garza, Jr., Edinburg City Manager; Leticia Reyes, Director of Business Development and Public Affairs, Edinburg Economic Development Corporation; Francisco Cigarroa, M.D., Chancellor of the University of Texas System; Ernest Aliseda of McAllen, Member, The University of Texas System Board of Regents; and Freddie Gómez, Research Analyst, Edinburg Economic Development Corporation. See story later in this posting. The North American Advanced Manufacturing Research and Education Initiative (NAAMREI) at South Texas College (STC) on Thursday, March 6, at the STC Technology Campus in McAllen celebrated the announcement of their $500,000 grant from the Wagner-Peyser program administered through the Office of Texas Governor Rick Perry. 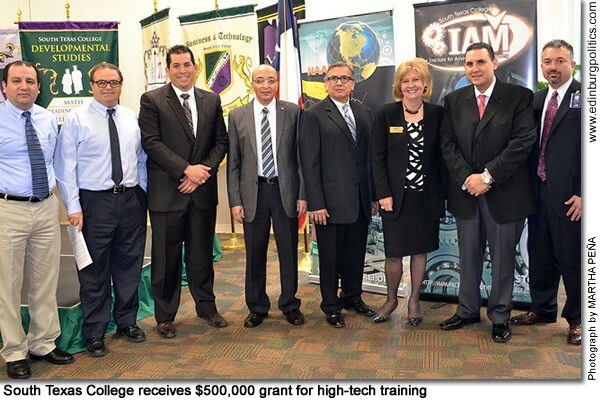 Local leaders, manufacturing partners and representatives from Houston Community College were present in support of this important grant that will provide training to 675 individuals in areas including robotics, mechatronics, programmable logic controllers and other advanced topics. “Our success rests on our partnerships with manufacturers,” STC President Dr. Shirley A. Reed said. “When you are successful, we are successful.” Mike Pérez, who retires as McAllen city manager on March 31, also addressed the crowd in support of this opportunity. “This grant is a cornerstone for developing a stronger labor structure in our region,” he said. Featured, from left: Ernesto Ávila, Training Specialist, South Texas College; Dr. Mataz Alcoutlabi, Assistant Professor, Department of Mechanical Engineering, the University of Texas-Pan American; Agustín?“Gus” García, Executive Director, Edinburg Edinburg Economic Development Corporation; Dr. Abdel Salan Hamdy Makhlouf, Professor, Department of Manufacturing Engineering, the University of Texas-Pan American; Mike Pérez, City Manager, City of McAllen;?Dr. Shirley A. Reed, President, South Texas College;?Ralph García, Vice President Business Recruitment, McAllen Economic Development Corporation; and?Carlos Margo, Interim Executive Director, STC NAAMREI. Rep. R.D. 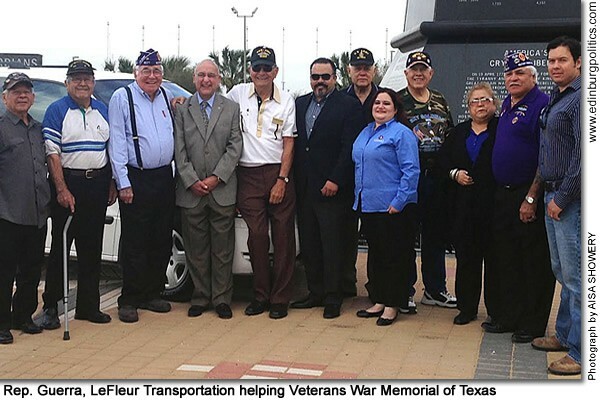 “Bobby” Guerra, D-McAllen, featured fourth from left, in conjunction with LeFleur Transportation, on Wednesday, March 19, gathered outside the Veterans War Memorial of Texas in McAllen to hand over the keys of a donated van to local veterans and members of the Veterans War Memorial Foundation of Texas. Guerra was able to facilitate this donation through the assistance and continued partnership with Colonel Frank S. Plummer, U.S. Air Force (Ret. ), President of the Veterans War Memorial Foundation of Texas, and Dr. Ricardo Chapa, a Marine Corps veteran and board member of the memorial foundation. “Giving back to our local veterans is the least I could do. The Veterans War Memorial Foundation helps remind us all of the ultimate sacrifice our service men and women have made in protecting our freedom,” said Guerra, who represents House District 41 in Hidalgo County. “I commend Col. Plummer and Dr. Chapa for all the good that they do for our veterans in the community. I would like to thank LeFleur Transportation for being instrumental in making this donation possible. It has been an honor working with members of the foundation, and I am very pleased to have fostered such great partnerships with our local veterans,” Guerra said. 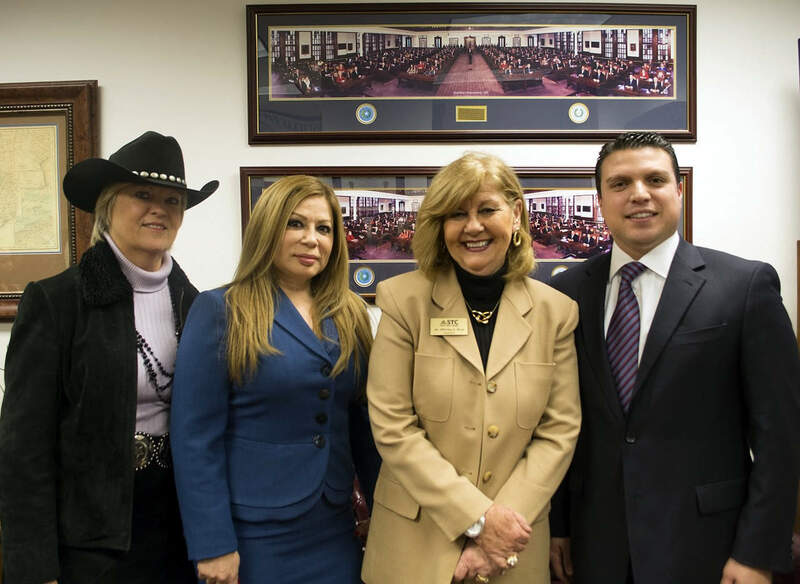 The state representative is flanked in this image by Chapa, who is featured third from left, and Plummer, who is featured fifth from left. The Veterans War Memorial Foundation depends on donations to help achieve its goal in completing the construction of their historical landmark, the state representative noted. See story later in this posting. 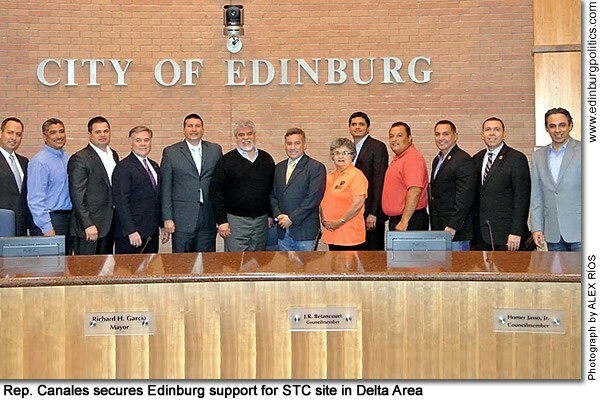 The Edinburg City Council on Wednesday, March 5, approved a city resolution calling on South Texas College to establish a site in the Delta Area as part of an ongoing legislative effort to expand higher education opportunities throughout Hidalgo County. The Delta Area features San Carlos, Elsa, Edcouch, La Villa and Monte Alto, communities that are connected by East State Highway 107 between Edinburg and Weslaco. The political support came after a presentation before the mayor and city council members by Rep. Terry Canales, D-Edinburg, who has been working with Congressman Rubén Hinojosa, D-Mercedes, and Rep. Óscar Longoria, Jr., D-La Joya, to convince STC to establish a physical presence in that region. 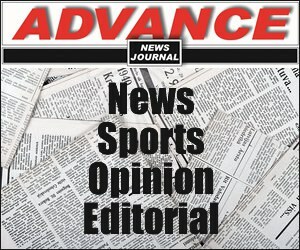 “South Texas College, which receives significant funding from all property taxpayers in Hidalgo and Starr counties, has an obligation to bring higher education opportunities and invest more of its resources in communities, such as in the Delta Area, which would most benefit from seeing a STC site in its own backyard,” said Canales, the Edinburg lawmaker whose House District 40 includes San Carlos and Elsa. Leaders supporting the expansion of STC into the Delta Area are not requesting any STC tax increase to achieve that goal. Featured from left: Ramiro Garza, Jr., Edinburg City Manager; David Torres, Member, Edinburg School Board; Councilmember Homer Jasso; Mayor Pro Tem Elías Longoria, Jr.; Councilmember Richard Molina; Mayor Richard García; Juan “Sonny” Palacios, President, Edinburg School Board; Carmen González, Member, Edinburg School Board; Councilmember J.R. Betancourt; Dr. Martín Castillo, Vice President, Edinburg School Board; Jaime Solis, Secretary, Edinburg School Board; Dr. René Gutiérrez, Superintendent, Edinburg School District; and Rep. Terry Canales, D-Edinburg. See story later in this posting. 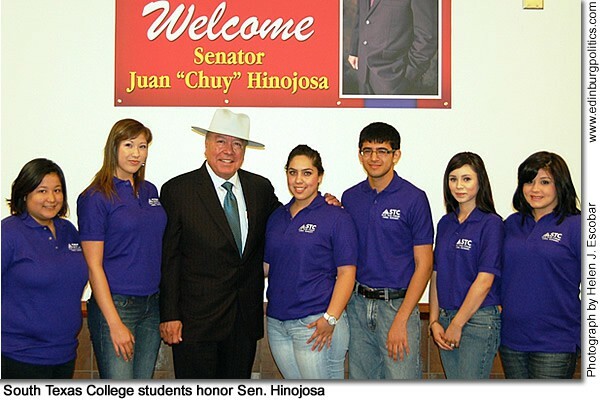 Sen. Juan “Chuy” Hinojosa, D-McAllen, was recently honored at a special celebration for his support for higher education during a gathering hosted by South Texas College at its Pecan Campus in McAllen. “What many people still don’t understand and I continually say is that here in the Valley you can really get a very solid higher education,” said Hinojosa. “This is a great country we live in. When I graduated college, I had several offers to attend law school and I went to Georgetown University. At first I felt out of place, but what I found is that Valley students can compete anywhere.” Featured, from left: STC Valley Scholars Program students Aurora Castillo and Maribel Bernal; Sen. Hinojosa; and Valley Scholars Ilsse Gracia, Mario Cerda, Karla Martínez and Gabrielle Marroquín. See story later in this posting. 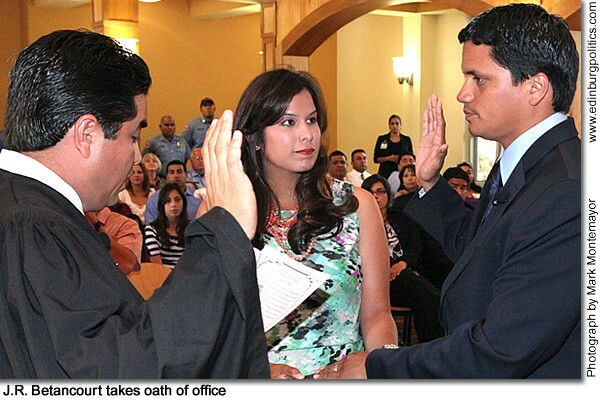 Newly-elected Edinburg City Councilmember J.R. Betancourt, featured right, takes his oath of office from Hidalgo County 92nd District Court Judge Ricardo Rodriguez, Jr., on Tuesday, May 15, while Betancourt’s wife, Renée Rodríguez-Betancourt, holds the Bible used for the ceremony. Betancourt, an Edinburg native, on Saturday, May 12, was elected to fill the unexpired term of former Mayor Pro Tem Noé Garza, who passed away in early January after battling cancer. Betancourt would be able to seek a full-four year term on the city council when the Place 2 seat is up for election in May 2013. 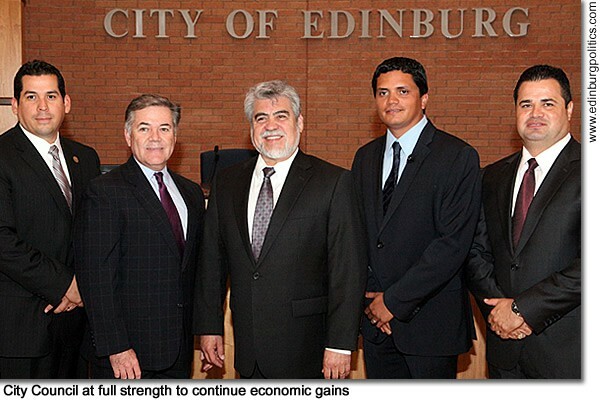 With the May 15 swearing-in of its latest member, J.R. Betancourt, featured second from right, the Edinburg City Council is at full strength to continue promoting economic development strategies and legislative policies that have helped Edinburg, according to Forbes magazine, to be part of one of the best medium-size regions in the U.S. for the creation of jobs. 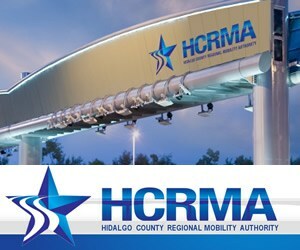 In its findings released on May 1, Forbes determined that the McAllen-Edinburg-Pharr-Mission MSA registered a 3.8 percent growth in jobs, and this year’s third-best ranking comes after an equally impressive 2011 showing, when the South Texas MSA was rated 6th among medium-size populations nationwide. Featured, from left: Mayor Pro Tem Gus García, Jr.; Councilmember Elias Longoria, Jr.; Mayor Richard García; Councilmember J.R. Betancourt; and Councilmember Homer Jasso, Jr. See story later in this posting. 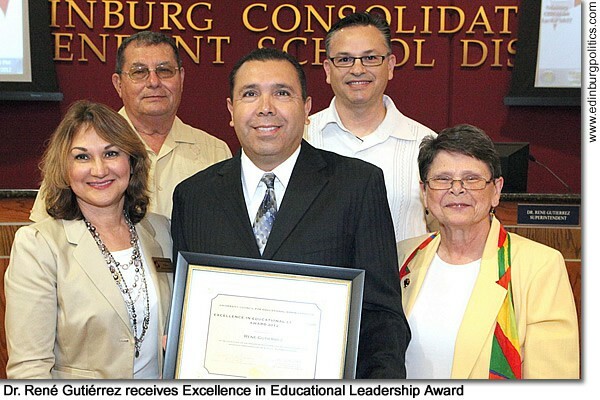 Dr. René Gutiérrez, featured center, the superintendent for the Edinburg school district, on May 8 received the Excellence in Educational Leadership Award from the University Council for Educational Administration. The honor was bestowed upon the superintendent during the regular meeting of the Edinburg school district’s Board of Trustees. Gutiérrez, who has been superintendent since July 2009, has exhibited clear-cut leadership that has met challenging issues head-on and brought about results that have enabled the district to maintain an impeccable record in student achievement, fiscal management, personnel development, transparency, school construction, public relations, crisis management, and parental involvement. Featured participating in the ceremony are, from first row, from left: Dr. Velma Menchaca, a professor with the Department of Educational Leadership at the University of Texas-Pan American; Dr. Gutiérrez; and Dr. Anita Pankake a professor with the Department of Educational Leadership at UT-Pan American. Back row, from left, are: Dr. Alejos Salinas, Jr., a member of the Board of Trustees for South Texas College who also serves as a lecturer with the Department of Educational Leadership at UT-Pan American; and Dr. Francisco Guajardo, an associate professor with the Department of Educational Leadership at UT-Pan American. The McAllen Chamber of Commerce Top 25 Committee on Wednesday, May 22, hosted their 28th Annual Top 25 Banquet that honored the top 25 academically performing graduates of McAllen High School, McAllen Memorial High School, and Nikki Rowe High Schools, plus the Top 4 Achieve Early College High School Students. Each student was awarded a $1,000 scholarship. 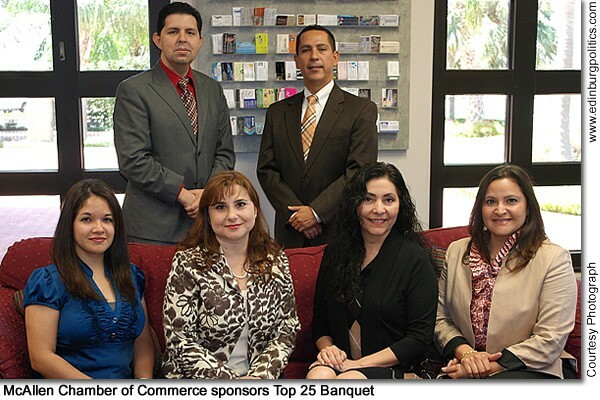 “We were very excited to sponsor the Top 25 Banquet for another year,” said Luis Cantú, Vice President of Community Development for the McAllen Chamber of Commerce. “Being able to raise the money to provide these McAllen school district students with a scholarship is always very pleasing.” Top 25 Committee members are featured, seated from left: Yajaira Villarreal; Cynthia Olivarez; Maryiel García; and Isela Herrera; and standing, from left: Luis Cantú; and Antonio Rosales, committee chairman. See story later in this posting. 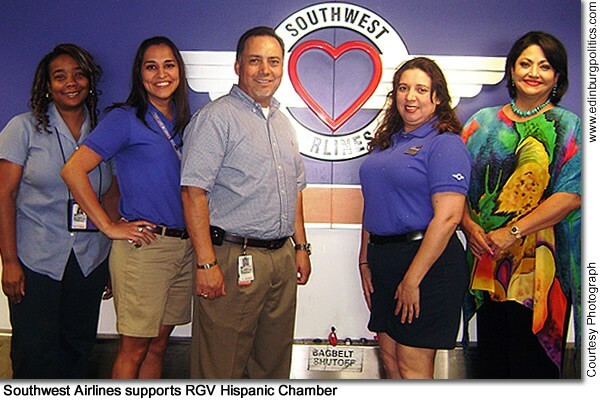 Southwest Airlines, located at the Rio Grande Valley International Airport in Harlingen, has become the latest partner for the Rio Grande Valley Hispanic Chamber of Commerce. 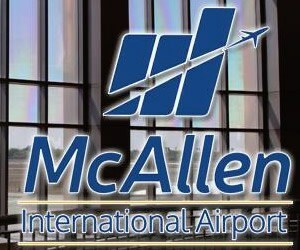 “It gives us great pleasure to be able to call Southwest Airlines our corporate partner”, said Cynthia M. Sakulenzki, president and CEO of the McAllen-based chamber. “Southwest Airlines recognizes that their customers come from all over the Valley.” There are several events that the Rio Grande Valley Hispanic Chamber of Commerce has scheduled which will require a combined partnership with Southwest Airlines to accommodate convention guests and state meetings scheduled in the Valley. Featured, from left: Christina Rivers, Southwest Airlines customer service agent; Becky Kirkpatrick, Southwest Airlines customer service agent; Mario Garza, Southwest Airlines station manager; Lily Colón, Southwest Airlines customer service supervisor; and Cynthia M. Sakulenzki, president and CEO of the Rio Grande Valley Hispanic Chamber of Commerce. 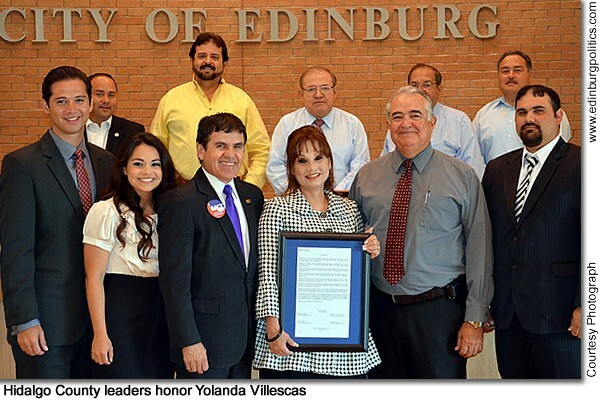 Yolanda Villescas of Edinburg, featured first row, center, on Tuesday, May 15, was honored by the Hidalgo County Commissioners Court with a resolution recognizing her retirement and 34 years of public service with the county government. Villescas’ impressive career with Hidalgo County began as a tax clerk in 1976, then saw her advance through the system until she attained the high-ranking level of tax collection manager for the Hidalgo County Tax Office. 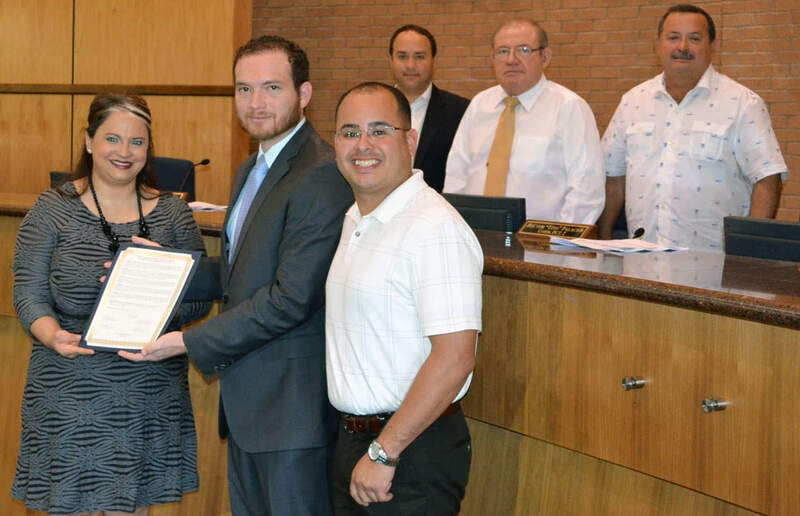 Featured, front row, from left: Son-in-law Agustín Hernández, Jr.; daughter Bianca Hernández; husband Xavier Villescas; Yolanda Villescas; Hidalgo County Tax Assessor-Collector Armando Barrera; and son Jaime Villescas. Back row, from left: Precinct 4 County Commissioner Joseph Palacios; Precint 3 County Commissioner Joe M. Flores; Hidalgo County Judge Ramón García; Precinct 2 County Commissioner Héctor “Tito” Palacios; and Precinct 1 County Commissioner Joel Quintanilla. 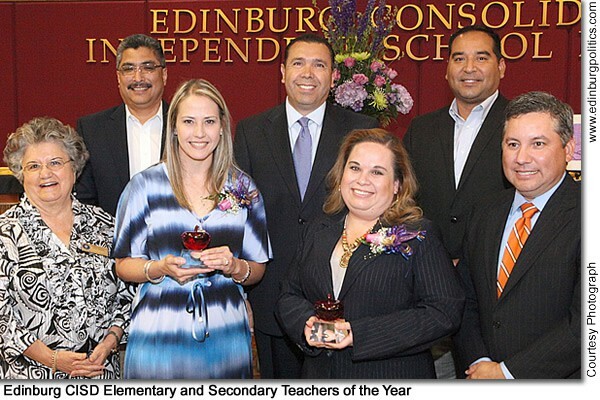 Mónica Pérez, featured front row, second from left, who is a fifth grade teacher at Esparza Elementary, and G. Marivel Vela-De la Rosa, front row, second from right, who is a middle school teacher at Brewster School, were named Secondary and Elementary Teachers of the Year for Edinburg at the recent District Teacher of the Year Banquet. The pair was selected from a list of seven finalists narrowed down by a committee composed of community members, business persons, and educators. Both Vela-De la Rosa and Pérez received a recognition plaque and a $1,200 check from the Edinburg Teachers Credit Union, plus they were surprised the next day with a beautiful bouquet of flowers. As Secondary and Elementary Teachers of the Year, Vela-De la Rosa and Pérez will be the keynote speakers at the 2012-2013 General Assembly for Edinburg school district. A total of 41 elementary and secondary teachers were also recognized at the District Teacher of the Year Banquet with a recognition plaque and a $200 check. Featured, front row, from left: Carmen González, president of the Edinburg school board; Mónica Pérez, Elementary Teacher of the Year; G. Marivel Vela-De la Rosa, Secondary Teacher of the Year; and Juan “Sonny” Palacios, vice president of the Edinburg school board. 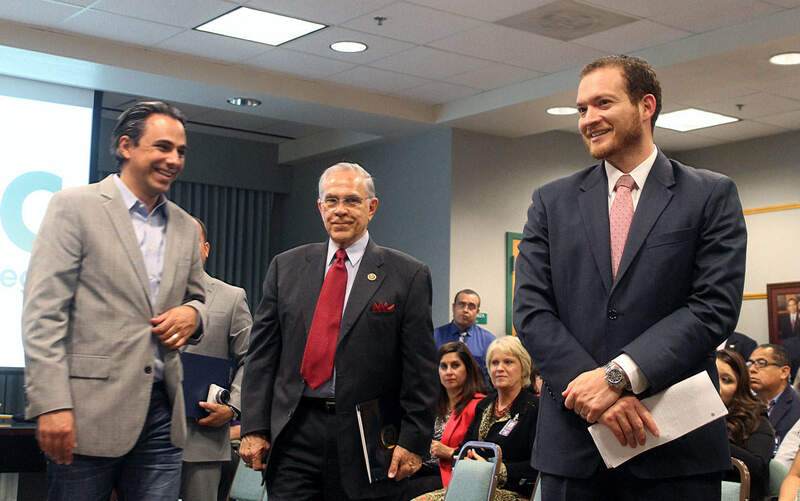 Standing, from left: David Torres, member of the Edinburg school board; Dr. René Gutiérrez, Superintendent of Schools; and Robert Peña Jr., member of the Edinburg school board. On Wednesday, May 9, Bob Vackar, owner of Bert Ogden Dealer Group, featured fifth from left, and Robert Lucio, general manager for Bert Ogden Dealer Group, featured fifth from right, provided leaders with the Edinburg Economic Development Corporation and the Edinburg Chamber of Commerce with highlights of the economic impact generated by the homegrown company, and explained how that data is used to benefit the entire city. 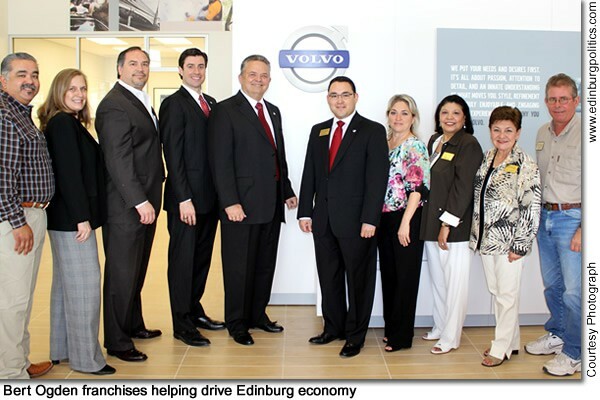 Their presentation was held at the company’s latest addition, Volvo of Edinburg, located at 4421 South Business 281. 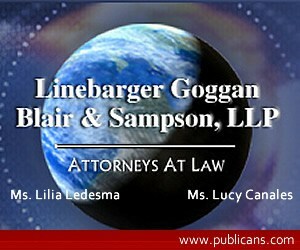 The two men were the distinguished speakers for the chamber’s Power Punch @ Lunch business mixer provided for its members. With more than $200 million in sales revenue generated in 2011 by Bert Ogden Dealer Group’s vehicle franchises in Edinburg, even much larger cities would be happy to be the hometown to such an economic success story. Featured, from left: Johnny Rodríguez, former chairman of the Edinburg Chamber of Commerce Board of Directors; Flo Prater, an ambassador for the Edinburg Chamber of Commerce; Jaime A. Rodríguez, a member of the Edinburg Economic Development Corporation Board of Directors; Will McCullough; Bob Vackar, owner of Bert Ogden Dealer Group; Robert Lucio, general manager for Bert Ogden Dealer Group; Letty González, president of the Edinburg Chamber of Commerce; Edna Peña, chairman of the Edinburg Chamber of Commerce Board of Directors; and Maggie Kent and Marty Martin, members of the Edinburg Chamber of Commerce Board of Directors. See lead story in this posting.